Trivendia provided tools for exercising. 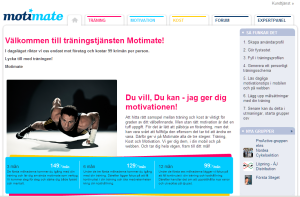 Motimate was a Web service that provided training, health and food advice to people in general. The service was fully commercial with paid memberships. Users got custom training schedules, exercises etc based on their training and health level. Users could also read up on 7000+ recipes, get active in the integrated community, read advice from experts in the field etc etc. The system consisted of a user portal, an admin portal, a mobile app portal and a mobile app for iPhone. Motimate is now closed down. Motimate was specified by and developed for Trivendia Sweden AB. Netville provided the development resources. Abiro handled project mangement and technical partnerships during 2009 and Q1 2010. Anders Borg then was site administrator, technical advisor, responsible for technical partnerships and substitute on the board.